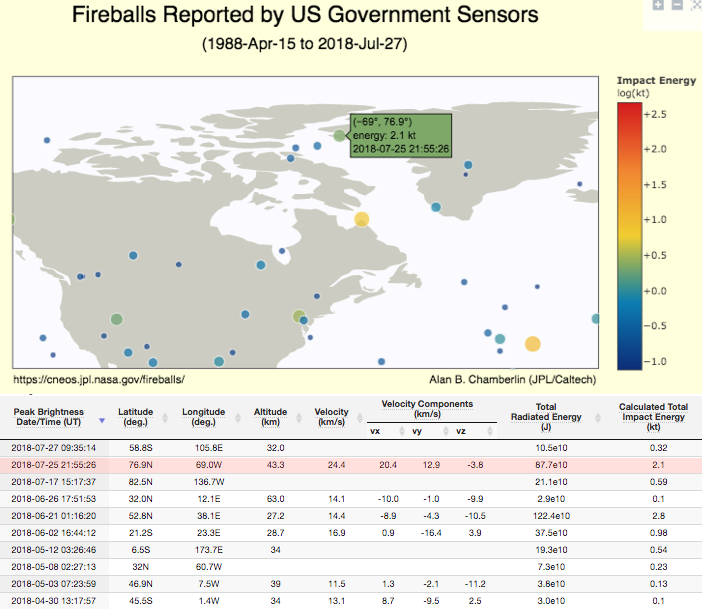 Data from NASA’s Jet Propulsion Laboratory shows reported fireball events for which geographic locations are provided. Each event’s calculated total impact energy is indicated by its relative size and by color. The record shows a meteor traveling at 24.4 kilometers per second (54,000 mph) at 76.9 degrees north latitude, 69.0 degrees west longitude, on July 25 at 11:55 p.m, slammed into the atmosphere directly over Thule, Greenland. 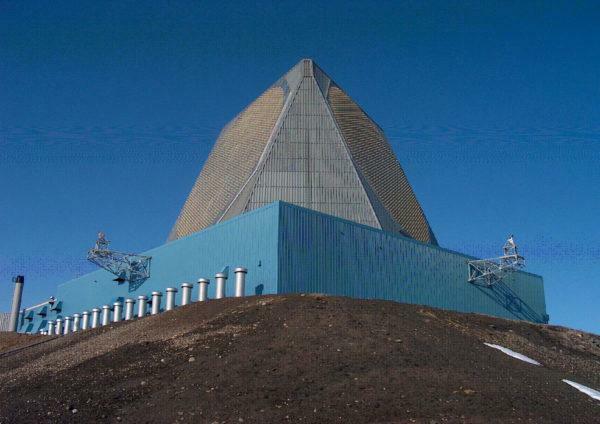 According to the Military Times, the meteor “struck…miles from a key U.S. early warning air base,” which is home to the 12th Space Warning Squadron based at Thule, that operates and maintains the Air Base in support of missile warning, space surveillance, and satellite command-and-control operations missions. Thule is located 1,207 km (750 miles) north of the Arctic Circle and 1,524 km (947 miles) from the North Pole on the northwest side of the island of Greenland. The story was first reported by Australian media, then blasted across America via Fox News on Friday. The article’s title read “Air Force remains silent after huge meteor hits near US military base,” which generated tremendous buzz on social media and triggered a swarm of journalist contacting the Air Base about the matter. The Aviationist’s Tom Demerly, who reported on the mystery meteor, wrote in an analysis that it is disturbing because there was no public warning from the U.S. government about the meteor impact. “Had it entered at a more perpendicular angle, it would have struck the earth with significantly greater force,” he wrote. As to “significantly greater force,” well, Demerly does not specifically define what that means as far as kilotons. However, the 2013 Chelyabinsk meteor incident (below) provides the very real understanding of the destructive nature of these space objects. 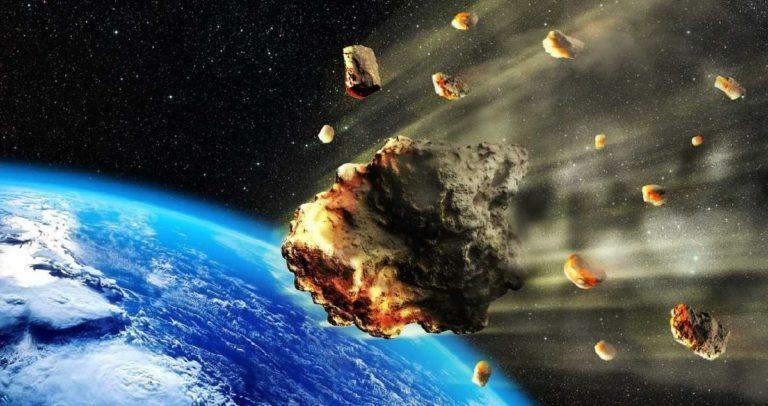 We ask just one question: Why did the US government initially fail to alert citizens of Greenland and the US of an incoming meteor that could have potentially been very dangerous? The Chelyabinsk meteor entered Earth’s atmosphere over Russia on February 2013, with a speed of 19 kilometers per second (42,500 mph). It quickly became a dazzling superbolide meteor over the southern Ural region. The bulk of the meteor’s energy was absorbed by the atmosphere, with total kinetic energy before atmospheric impact estimated from infrasound and seismic measurements to be equivalent to the blast yield of 400–500 kilotons or roughly 26 to 33 times as much energy as that released from the atomic bomb detonated at Hiroshima. This footage below from multiple closed-circuit television systems recorded the moment when the meteor slammed into the Earth’s atmosphere generating a massive shockwave across the Ural region.